Laurel Falls, Best Family Hike! I think Laurel Falls is the best waterfall hike to take your family on because that's just what I did with mine. That includes my niece, who was a toddler at the time. The trail is 1.3 miles to the 75' falls and is paved. This makes it one of the rare trails in the Smokies you can push strollers and wheelchairs down. It's pretty level with an elevation gain of 314'. While this waterfall hike wasn't my favorite, because of the crowds, what I liked was the fact the whole family could hike it. By the way, my Dad and sister are not hikers and they made it! So if you're taking the family to the Smokies, check this trail out. If you only go as far as the falls, it will be 2.6 miles roundtrip. 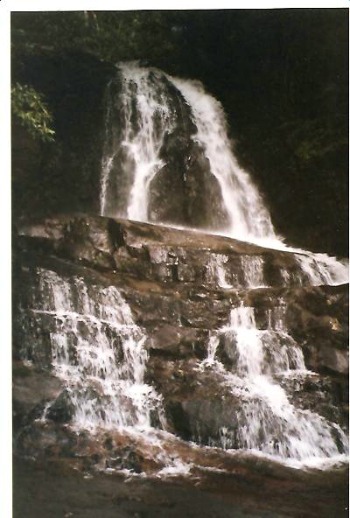 Since Laurel Falls looks tiers or a staircase, I would call it a tiered or staircase waterfall. Approximate Elevation: Starts at 2300' at Little River Rd. Trail ascends to 2600' at Laurel Falls. How to get to the trail: From Sugarlands Visitor Center (Gatlinburg entrance), take Little River Rd. (open year-round, weather permitting) towards Cades Cove. Drive 3.5 miles to trailhead. You can park on either side of the road.